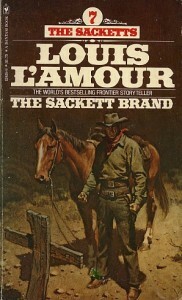 This book is one in Louis L’Amour’s series about the Sackett family. It was one of my favorites as a kid. It chronicles the story of William Tell Sackett and his revenge on his wife’s murderers. The Sackett Brand follows the pattern of many of L’Amour’s stories (which I will not ruin for you here). Needless to say, it is sweet! Five Stars (out of five), one of my favorite ‘Louis’ ever. It was still cold … bitter cold. I tried not to think of that, but just kept inching along. Sometimes I pulled myself along by grasping branches or clutching at cracks in the rock. Cold as it was, I started to sweat, and that scared me. If that sweat froze, the heat in my body would be used up fighting its cold and I’d die. Once I broke a hole in the ice and drank, but most of the time I just kept moving because I’d never learned how to quit. I was just a big raw-boned cowboy with big shoulders and big hands who was never much account except for hard work and fighting. Back in the Tennessee hills they used to say my feet were too big for dancing and I hadn’t any ear for music; but along about fighting time I’d be there – fist, gun, or bowie knife. All of us Sacketts were pretty much on the shoot. This entry was posted on Wednesday, January 28th, 2009 at 11.54 pm and is filed under art wednesday, louis lamour. You can follow any responses to this entry through the RSS 2.0 feed. You can leave a response, or trackback from your own site.